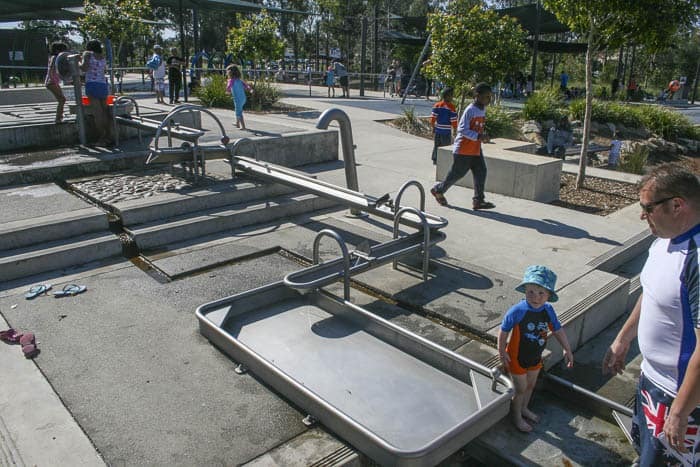 How great is a playground with water play? Ideal for scorching Sydney days. 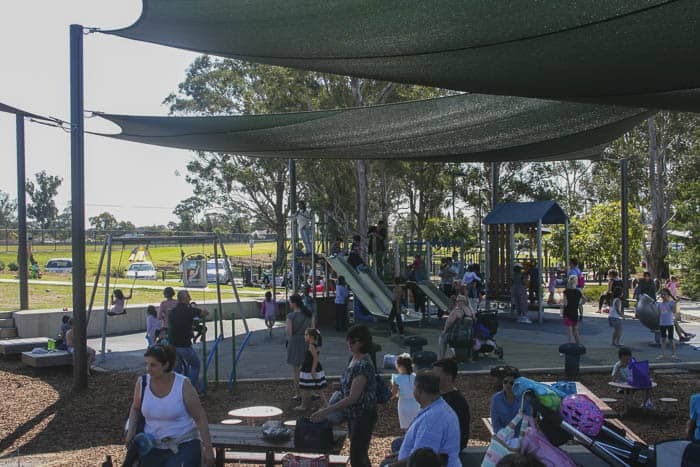 Francis Park, within the Blacktown Showground Precinct is a large and very popular park. 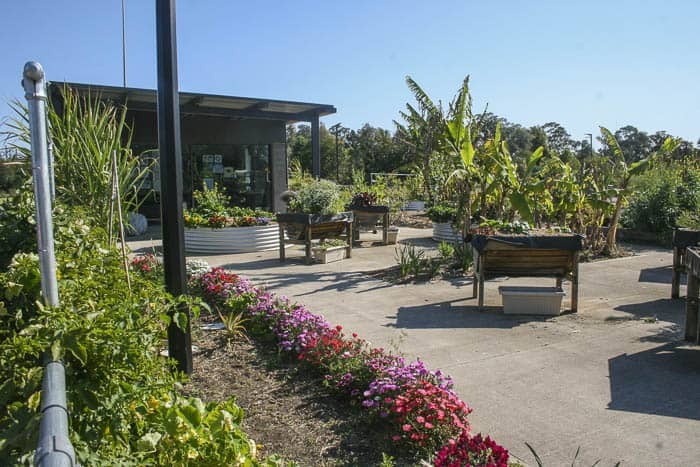 It is very close to Blacktown station and has beautiful grounds with waterways and woodlands which attract local bird life. 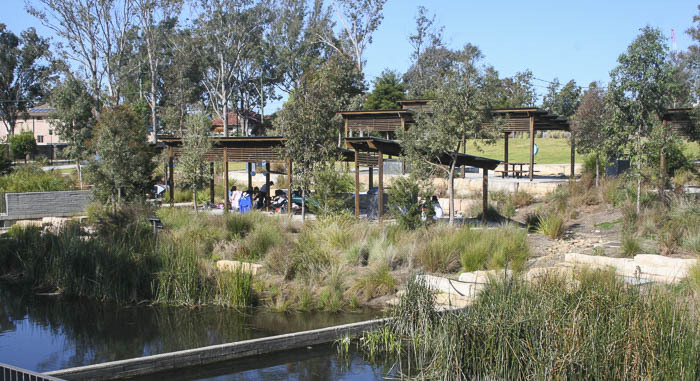 Francis Park is ideal for large groups, it has shaded picnic tables and BBQs and is very accessible with concrete pathways throughout the park. In fact on the warm spring Sunday afternoon that we were last there I counted eight different parties in full swing! 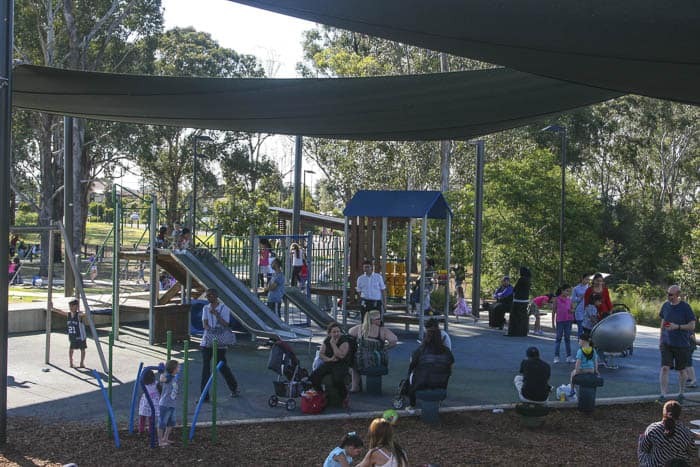 The park has a shaded play area ideal for younger children with swings, slides, climbing equipment and forts. It is often crowded on weekends and school holidays but on week days it is perfect for toddlers and pre-schoolers when they can take their time. Parents need to closely supervise as there are a few high points that could present falling hazards to more adventurous kids but there are lots of low level attractions for the very early walker or crawler to explore. 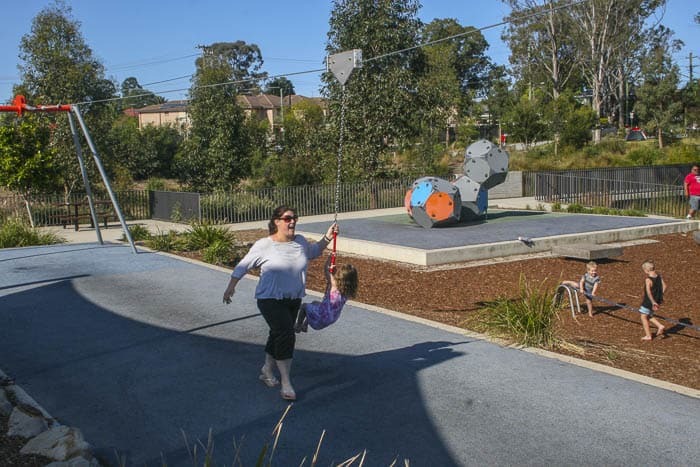 There is a play area designed for older children with climbing cubes, a flying fox, larger swing and a balance course. This isn’t shaded and can be really hot in the summer but is well laid out and generally less crowded. There are also two water play areas, the first is a course of water channels where kids control the flow of water via a water wheel and a series of gates. This one is open all year around. 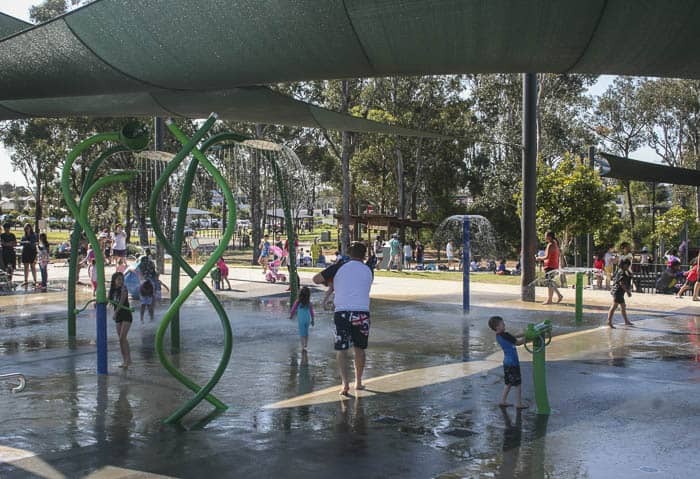 The shaded splash park open from September to May that is undoubtedly the most popular part of the park. 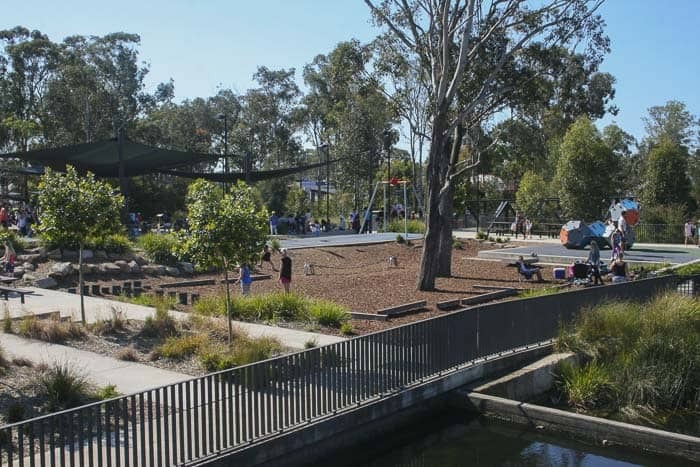 Within the precinct there are also playing fields for ball games, courts for netball and basketball, community gardens and a multi-use track for walking, jogging and cycling. Mum’s report: This park is great for small kids unless it’s very busy (which it often is on weekends and school holidays when the sun is shining), it is perfect for a mums and toddlers catch up during the week or for a pram walk. The senior playground is good for six – 14 years olds too. 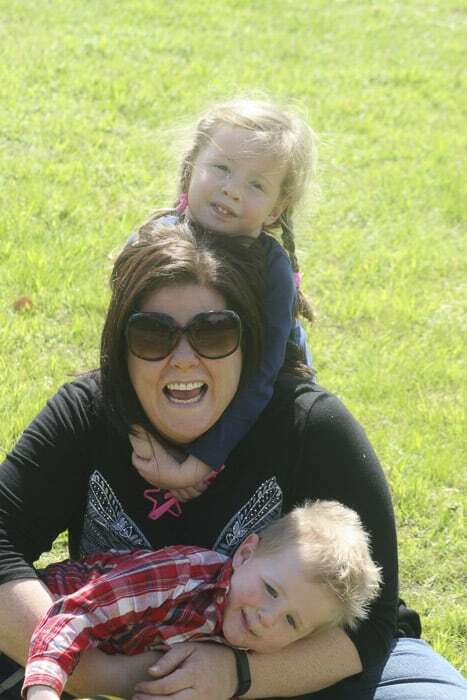 Melanie Cross loves exploring Sydney with her three and a half year old daughter and almost two year old son. Thank you, Mel. Thanks for the great info. I reckon we’ll head down soon, partically to the splash zone. My kids love the one over at Parra near the station. Western Sydney’s better than they say, right! Hey can we book a shelter and bbq area for a toddlers birthday party for April? Hi there, you need to get int ouch with the locl council to check that, so sorry. I have written a review of the park and playground here, it is managed by the local council.